He started jumping over chairs, now he is making leaps in the track scene. It was a playful pastime. Now it is a perennial pursuit. Khan Meng Linn became a national long jumper this year, at the age of 24. Normal meant more jumping. When he turned teenager, he got inventive with it. “It’s very silly. In secondary school we will stack the chairs and see how many we can jump over during breaks in between the lessons,” he said. In his home, he sometimes jumps to touch his ceiling and it results in rebuke most of the time. “The neighbours will complain,” his parents would say. As a freshman in Ngee Ann polytechnic, he went to the institution’s sports camp and tried track. He liked it, naturally, and joined the school’s track and field team. 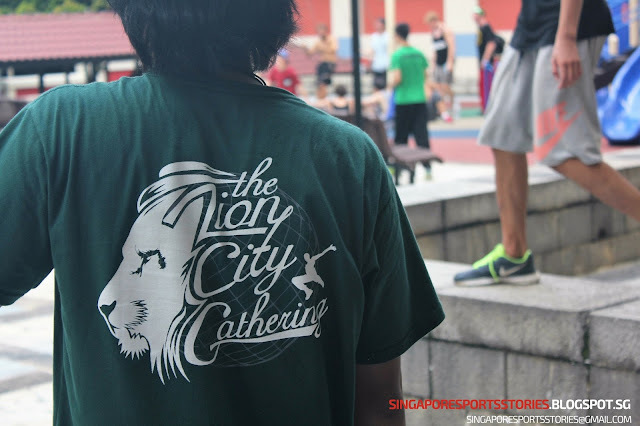 The Institute-Varsity-Polytechnic Games (IVP) were the apex of varsity sport competition and Meng Linn represented Ngee Ann in all of his three years. IVP 2007 was his first proper track meet. He no longer jumped for fun amongst friends. 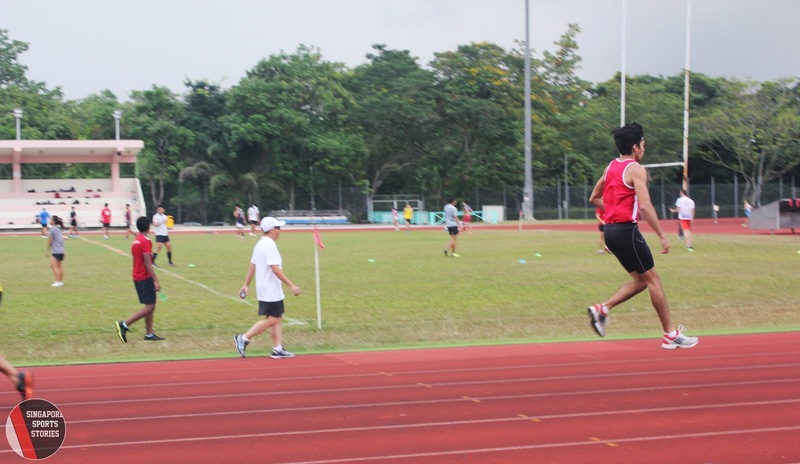 He was jumping for Ngee Ann against adversaries. He did the high and long jump, finishing in the bottom few for both. “Quite nervous because you don’t know what to expect until after the actual experience,” Meng Linn said. But there was no doubt he could jump. “2007 was my first IVP, 2008 was my second, and by 2009, I started to see a bit of result,” he said. It was his final IVP as a polytechnic student and three years of track training was fulfilled. He got third for long jump with a 6.21m effort, finishing behind just the university athletes. Then the obligatory national service came, putting a hiatus to competitive jumping. Now in Singapore Institute of Management (SIM), Meng Linn is once again in a track and field team. Once again, he competes in the IVP, this time for SIM. At IVP 2013, he jumped 6.83m, smashing his previous best by 62cm. That got him third. Track success seems imminent. The subsequent IVP reaped the same result, third, albeit a shorter jump, 6.75m. Then, at the Akira Swift 61st Annual Track & Field Championships 2014, it got shorter, he jumped 6.63m. There was a semblance of stagnancy. Fact was Meng Linn just needed tweaking. 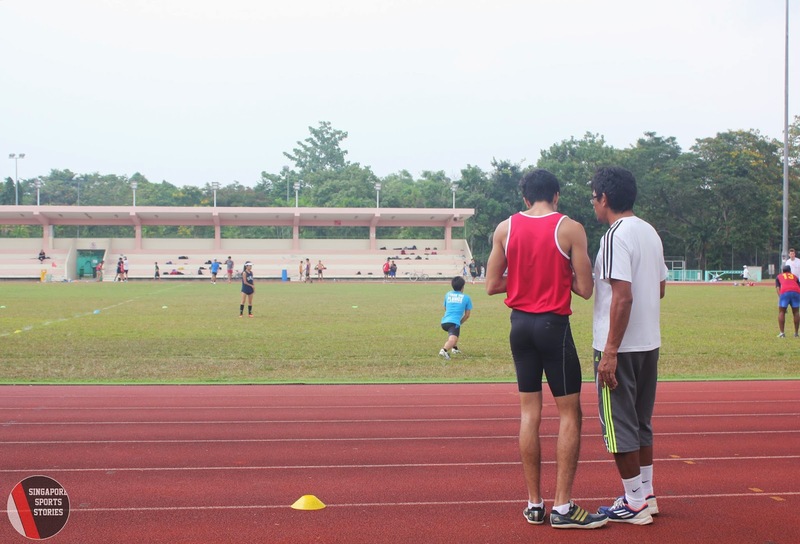 At the Swift meet, he met Mr Kamarulzaman Tahir, the track coach for St. Joseph's Institution. Meng Linn was training mostly on his own then. “I talked to him and told him that I will train with him and that it’s a long term decision, not short term,” said Meng Linn. “He can jump,” was how coach Kamarulzaman described Meng Linn. The coach-athlete relationship was formed. Three weeks under coach Kamarulzaman, Meng Linn marked a new milestone. “This year I made a breakthrough in long jump, I finally broke the 7 metre mark,” he said. It was at the Johor Open Track and Field 2014. Prior to the competition, coach Kamarulzaman focused on Meng Linn’s run up and that worked. 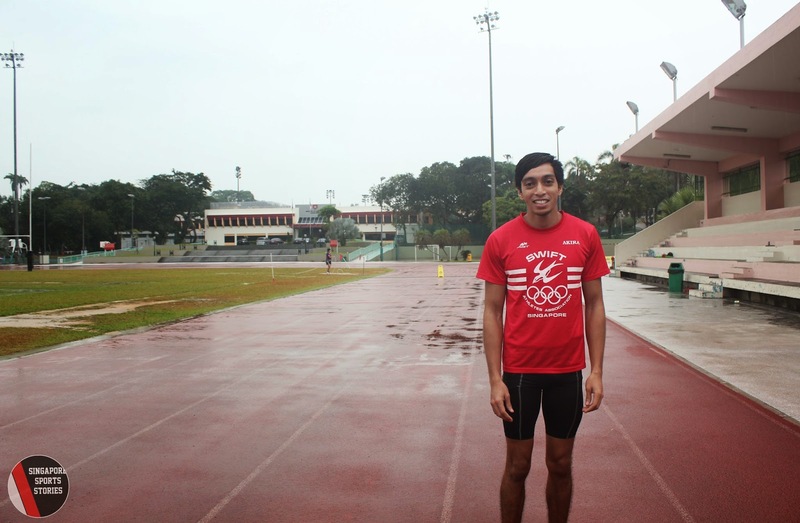 The result got him a national call up to represent Singapore in the 76th Singapore Open Track and Field Championships 2014. “In the past, I’ve been to SG Open, but this year it’s one of the toughest one I took part in,” said Meng Linn. With the national flag on his chest, he managed a personal best again, 7.26m, and finished sixth out of 14 international athletes. Meng Linn trains three times on the track and three times in the gym on top of lessons during the season. “This is something I enjoy so I don’t view it as a sacrifice,” he said. Meng Sunn shared that Meng Linn would research on the sport in his free time. “He will look for workouts and things like that on Youtube,” said Meng Sunn. Now, a full-fledged national long jumper, Meng Linn is not expecting things to fall into place. “It is not about asking for support, it is about meeting the mark,” he said. Rather than others, the mark seems to be dictated by Meng Linn. “There is a pressure to perform, mostly self-imposed,” Meng Linn said. It is a sport where you sprint and jump. It sounds and looks deceptively straightforward, but at the top level, things are more complex. “Now there are more things to take note of, the pacing for the run up, when you take off, the things you are supposed to do in the air, how you are supposed to land. “You have to manage everything at one time, if you focus too much on one portion then you neglect the others,” said Meng Linn. So with every repeated, calculated jump, he hopes it brings him closer to his goal to compete on the grandest sport stage. “Every kid, there’s a dream; you want to represent your country in some kind of sport. When you watch Olympics you get a bit of inspiration, you want to represent your country,” said Meng Linn. The immediate goal, for now, is an 8 metre leap. His focus now set on the ASEAN University Games 2014 in Palembang, Indonesia. Every jump he makes now will be unlike 10 years ago. It will not be over chairs. It will be an explosive run up, a precise take off, before a sandy landing. The parents will not be scolding, and the neighbours will not be complaining. They will be cheering Meng Linn as he strives to leap a little higher, jump a little further, and get a little closer to the eight metre mark, from here on with the Singapore flag on his chest.